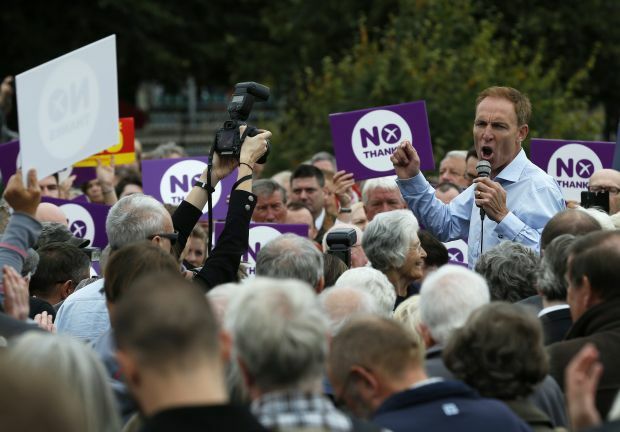 MANCHESTER, England (CNS) — Scotland’s archbishops have encouraged Catholics to vote in the forthcoming referendum on independence — and to pay attention to the issue of religious freedom. The Sept. 18 ballot will decide whether Scotland will break away from union with England and Wales after more than 300 years. Archbishops Philip Tartaglia of Glasgow and Leo Cushley of St. Andrews and Edinburgh each issued pastoral messages Aug. 31 to encourage Catholics to help to shape the outcome of the election. They did not direct Catholics precisely how to vote but urged their participation and asked them to reflect on issues of concern when making their decision. In a longer pastoral letter, Archbishop Cushley asked the faithful to have religious freedom at the forefront of their concerns when considering how they should vote. “We are called to promote peace, integral human development and authentic human rights, and to have a special care for the poorest and the weakest in society,” Archbishop Cushley said. “So I encourage you, in the light of Catholic social teaching, carefully to consider the issues and to do your civic duty on the day itself,” he said. The referendum was called by the Scottish National Party after it won Scottish parliamentary elections by a landslide in 2011. The party has fought a long campaign for the repeal of the 1707 Act of Union that united Scotland to the rest of Britain. On referendum day voters will be presented with the single question: “Should Scotland be an independent country?” to which they will be invited to answer either yes or no. Opinion polls have repeatedly found that a small majority say they are in favor of Scotland remaining part of the United Kingdom of Great Britain (England, Scotland and Wales) and Northern Ireland, but support for independence appears to be increasing, and the narrowing margin is making the outcome of the vote uncertain. Much of the public debate has so far focused on the issues of North Sea oil reserves, which nationalists say would make an independent Scotland a wealthy nation, and the continued use of the pound as currency. Residents of Scotland who are at least 16 years old are eligible to vote, meaning that 400,000 non-Scots living in the country will have a say in the referendum while some 800,000 Scots living in England and Wales will not.